The fascination with the automobile began very early and grew more impassioned as the years passed. Before he could even drive, Michael was fixing neighbor’s cars to raise enough money to get his own. The local newspaper classifieds helped with that goal. Cheap cars could be fixed or lightly refurbished and sold for a profit. Volkswagens were good targets because everyone wanted one in the 60s yet there were few mechanics willing to work on them. Air-cooled Volkswagens led directly to early Porsche 356s and the profit margins improved. College led to computer technology. It included more car repair business for working capital. After graduation, IBM offered a tour and a position in trouble-shooting and repair. Compared to fixing Porsches, it didn’t pay enough. A better offer came from Bob Smith VW Porsche in Hollywood. His self-trained experience was not quite enough so he was offered a position at Foothill VW in La Canada preparing trade-ins for resale. That was his real experience. He had bought , repaired, and resold Porsches for some time. Bill Stubbs was the service manager at the time. He recognized the natural talent in his young mechanic. The concept of diagnostics was a new term for an old process, but took it into a more scientific realm. Stubbs offered to send him to school to learn diagnostics. Autoscan, the creators of a new device to diagnose engine function was offering to train technicians to more effectively use their machine. He considered the process: The service shop was a commission business; the diagnostic tech would submit a report to the service writer who would give the job to a line mechanic who would get the commission. Michael stayed with the trade-in repairs with the goal of having his own shop. In the meantime he continued to buy and sell cars in the LA Times. On a memorable Sunday, a Porsche Speedster was offered without an engine for $600, a great car of his own for the right price. The Bob Smith engine shop assembled an engine out of a set of pieces. from a collection of broken engines in the storage building – for 2 cases of beer. The beautifully restored Speedster was a perfect LA driver and became his signature suit. A new world walks into his life. A representative of US Universal lubricants and acid neutralizing additives introduced himself and a new unexpected venture. Michael created a series of tests of his own, just to assure himself of the acid-reducing effectiveness of the products. When the rep returned the following week, he was given a lecture on the new engine lubricant tests developed by the young mechanic. An appointment was arranged for the company executive staff to see and hear what he had done and the enthusiasm by which it was explained. A room full of smiles offered him a full-time job doing seminars and selling the products into fleet and dealership service centers. . The seminars were a hit. The direct sales were not. According to his new sales manager, the Speedster was not enough of a suit for a serious salesman. He would step in for a couple of real suits with neckties – and a new company car. “Write yourself a business plan to win a new Lincoln, Cadillac, or Thunderbird” the sales manager said. “You have 90 days to win the car.” The Lincoln MK IV was Michael’s choice. “Go to the dealership and pick out a car with everything you want in it. Take the brochure and tape it to your mirror so you can see it every morning.” The sales manager told him. Sales boomed quickly! There were more sales the second month and $5000 in sales on the third month – 1972 dollars. The Lincoln didn’t hurt for a business lunch either. He was soon top national salesman and was working with a team. Aware of the new situation, his high school girlfriend, now wife, wanted a new car. Mike’s friend Rob Nedrow’s father worked for Courtesy Chevrolet in Los Angeles. There they purchased Barbara’s first new car. Rob’s father made the purchase easy, friendly, and treated them with respect. There were no games. It was a remarkable example of customer service. That gave Mike the idea to start Autoland. With no little inspiration from that experience, Michael went to the DMV to acquire a dealer’s license that would enable him to sell all makes and models. His friend Roy Okuma had such a license. Michael offered his friends Jim and Helen, people who showed such a gracious style in the business of selling cars at their Chevrolet dealership, a partnership in July of 1971. This would allow Jim to sell any and every kind of car. Based on his remarkable success with US Universal and a sound relationship with the corporate financial officer, Michael requested a pro forma be drawn up based on the known quality of his friend’s salesmanship. This permitted the partnership to proceed. Michael eventually bought Jim’s share of Autoland once Jim became ill. Jim continued to work for Autoland until he passed away. Michael stayed with US Universal and his on-going success there. The 1973 oil crisis made the car business plan virtually impossible; no one wanted American cars and import dealers did not need to discount. Dealers were cutting him out. He went back to the LA Times classifieds and an extended business in buying, refurbishing, and reselling, then renegotiating a tighter net adding fine sound systems and other luxury elements realigned the formula again. From an expanding inventory of quality makes, Autoland was a hit. The concept of renting fine used cars from the inventory was even more so – and rent to buy was a huge hit. The concept was to place his sales people inside credit union offices to sell and finance on the spot. Thirty years and 600 locations later, he sold Autoland in 2001. Michael then began keeping the best cars he found – a car collection based entirely on cars he liked after a lifetime of hands-on experience with everything. Leadership in Carsdirect.com and Internet Brands fed the serial entrepreneur and innovator and allowed his car collection to pass 100 cars. The collection included everything from the tiniest post war family survival transportation to the most rare and best loved of the auto enthusiast’s world. In search of a larger office space to house his growing administrative staff, it was suggested that he simply purchase an office building. Additional office buildings and shopping centers across California and Texas satisfy the hunger to a degree but not the appetite of a passionate car enthusiast. 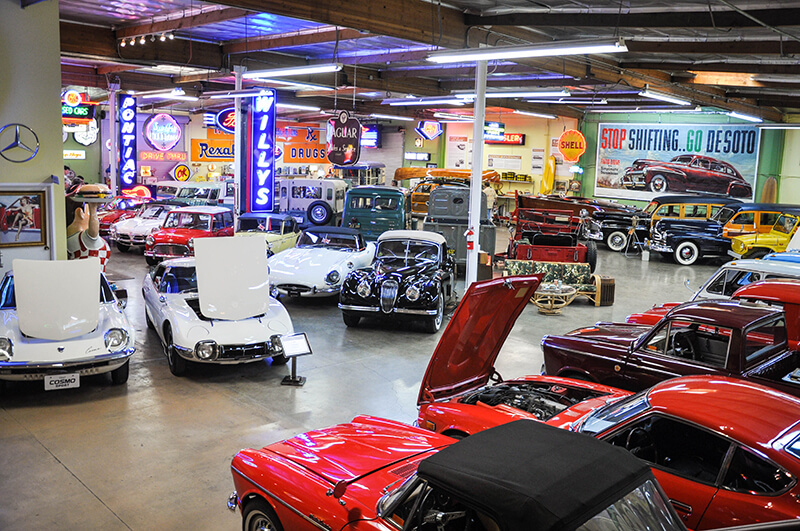 The Michael Malamut Collection is not a public museum, but it is available for car club groups and charity events. Let us know what you expect from your visit. We can do everything from a guided tour with stories, tables with linen and fine dining amongst the cars or just access and time to walk through and look around.